Shop the best personal Cases & Organizers for your personal collections. 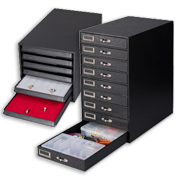 Perfect for jewelry storage, from bracelets, earrings & pendants to rings, necklaces & other precious pieces. Discover beautiful & practical pieces, with mirrors & drawers, made of velvet, leatherette or suede, at affordable prices thanks to our discount sales.